More and more we’re seeing employers asking about how to help employees with health insurance. That’s great! Just how to go about doing it is where things get confusing. In this post we’ll lay out the landscape as we see it and how we go about consulting clients on healthcare for their employee(s). In December 2016, the 21st Century Cures Act was signed. 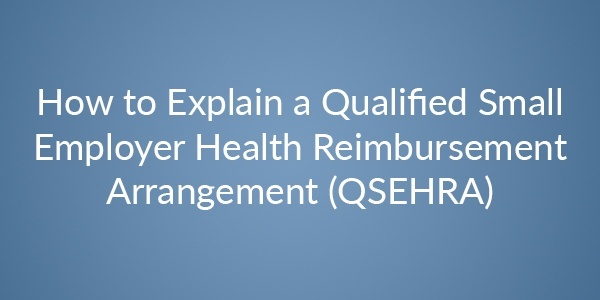 Tacked on to the end (§ 18001) is the creation of the Qualified Small Employer Health Reimbursement Arrangement (QSEHRA). Simply put, a QSEHRA is to be used by an employer with fewer than 50 full time employees that does not offer a group health plan to any of their employees (congressional summary). The IRS allows an employer to reimburse healthcare costs to their employee tax free up to annual limits. In 2019 those limits were $5,150 for a single plan and $10,450 for a family plan; these limits are prorated to monthly equivalents. Each employee will need to have an ACA compliant plan (any plan that meets "minimum essential coverage," basically a plan purchased through healthcare.gov) and the reimbursement is good for any qualified healthcare expense – premiums, co-pays, prescriptions, etc. Any reimbursement given over the annual or monthly limit will count as taxable wages for both the employer and employee. This arrangement must be accompanied by plan documents. We have drafted a sample template to help make that easier. Lastly, in order for these reimbursements to remain tax free they must be reported on the employee's Form W-2. The purpose of this is because an employer reimbursement will reduce or remove the subsidy the employee might receive from the government. An employee cannot legally have a full government subsidy and a reimbursement from their employer. A QSEHRA is designed to have an employee purchase their own insurance plan from the marketplace and then be reimbursed by their employer for the expenses. After a qualifying expense, an employee would submit a reimbursement form (included in the sample template linked above) to their employer and then receive the funds, likely with their next paycheck. Whether this reimbursement is straight from an employer or through a payroll service like ours doesn’t matter, the important thing is that it gets recorded properly. At the end of the year all QSEHRA reimbursements made are reported on the employee’s Form W-2. Employers can use a QSEHRA as a benefit to help sweeten their offer. They can offer it in addition to the wage they were already planning on, or potentially save some taxes on both sides by shifting some taxable wage to the QSEHRA instead. The example below illustrates how that would work. 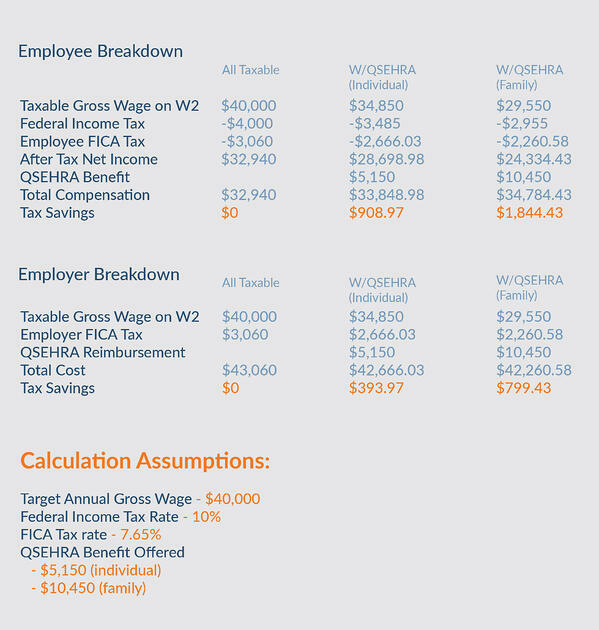 Assuming a 10% tax rate and a full single plan reimbursement of $5,150 in the year, an employee making $40,000 with no QSEHRA would have a net income of $32,940. If you were to offer the same $40,000 but included in that a QSEHRA, you would pay $34,850 in wages, your employee would net $28,698.98 PLUS the $5,150 in reimbursement for a total compensation after federal tax of $33,848.98. The lower taxable wage also means tax savings for the employer (~$400 in this case). Below is a breakdown showing this example in more detail. There is much confusion around QSEHRAs mostly because they were created in a way that did not produce any fanfare. The actuality is that these are easy to set up, easy to manage, and offer benefits to both the employer and employee. We’re happy to answer any questions about QSEHRAs or help you set one up, just reach out to us with the form below or call our office at 1-877-899-3004.